This steep property had a fantastic view. But the home would require very special design to fit properly. The clients wanted privacy to keep others from seeing in, but of course they wanted to see out. They had already sketched a plan that was very well thought out, but it was out of budget, and needed some work to fit on this steep site. 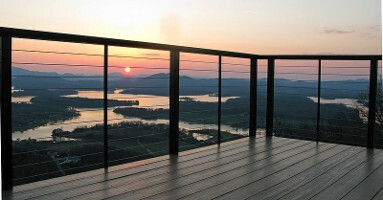 The view of the mountains around Lake Chatuge is never the same twice. The property was much more steep than I imagined. I had to hold on to branches to keep my balance. We selected the spot that was just a little less steep. 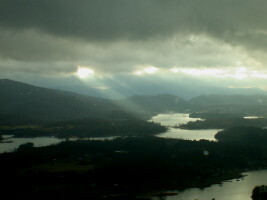 I measured the slope and the solar directions, and took photographs of the views. To reduce the budget, we needed to reduce the size of the home. Their plan included a fourth level office in a tower with a hidden entrance. I suggested a space inside the attic with a hidden entrance, much easier to build. I also worked to align the structure on each level to simplify the construction. And to spend less on excavation on this steep slope I worked on making the house more narrow. There was no way to make this home passive solar. The site was too steep, and it sloped the wrong direction. Because the site was so high, it would have much stonger winds, making the house difficult to heat. I suggested reducing the amount of glass, using better quality windows, and carefully placing them to face the view. I also recommended cutting down on the drafts by using sprayfoam insulation and a sealed, insulated crawlspace. The foundation walls were insulated on the exterior surface, allowing us to use the concrete as thermal mass to keep the house temperature more constant. The clients also wanted a lot of "smart house" technology, including a complete video, audio, security, and lighting control system. That is all cool, but proved to require a lot of extra maintenance. I prefer simplicity. The deck floor joists were anchored into the house so they would not need outside columns. Excavation begins. 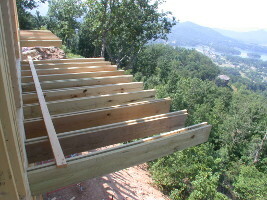 To support the decks it cost less money to build an engineer designed cantilevered deck system than a special foundation with extremely long columns to support the decks. These are some of the ideas we used to build a better home for less cost on this steep property. The elevator was a life saver on move in day. Looking down three levels of stairway. I believe all homes should be accessible by a wheelchair, especially if the clients are not young. How could we do this on a home with three levels? The easiest solution was an elevator. You might be surprised how little they cost. This also added value to the home. 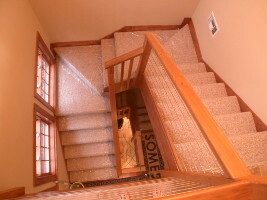 I also suggested an open stairwell because it was so intresting to look down all three levels from the upper level foyer. I was concerned when the clients decided to be their own contractor, especially with such a complicated home on an extremely steep property. I offered to make myself available for inspection and consultation whenever they needed me. I was also able to assist in getting the building department to approve the cutting edge features of this home. The wife directed the entire project, and it was very successfully completed in seven months. She went on to get a contractor's license and a home inspection license, and start the business: Your Inspection Expert. This home is certainly a great recommendation for her ablities. (A few years later she was offered a good engineering job and sold me the home inspection business). 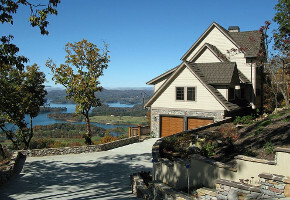 The client gave me this review on My HOUZZ Profile: "When my husband and I purchased a fantastic mountain top lot in Hayesville, North Carolina, we went on a search for an innovative and highly experienced designer. We found it – Richard MacCrea. Richard was able to address three critical needs for this project. 1. 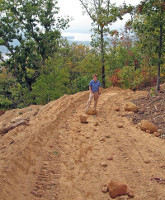 The site was extremely steep and difficult. The home was precisely designed to fit the site, which reduced excavation and construction costs. 2. Most of the common methods for making this home energy efficient were not practical because of the building site. We wanted energy efficiency, but we did not want to pay extra for it. The design included the methods that worked best and cost the least. The plan included better windows and spray foam insulation to keep out the drafts from high altitude winds. A sealed and insulated crawlspace kept the drafts out of the floor and provided extra storage. We discovered that heating and cooling was very inexpensive once we moved in because of the design. 3. The home was also designed for the spectacular, high altitude view. The views from this design are exquisite and breathtaking. See pictures. We were very pleased with Richard’s professionalism, knowledge, and reasonable pricing. He also delivered on schedule. If we had it all to do over again we would not change a thing! Perfect in every respect."